Back in the mid-70s, local contractor A.N. Johnston started construction on a ready-mix cement plant on a plot of land he owned along the edge of Fairview. His property, totaling 29.59 acres, was completely surrounded by N.P.S.-owned land. “We came to fear degradation of resources,” Park Superintendent Dixon Freeland told the Fredericksburg Free-Lance Star at the time. Several attempts to acquire the land failed, but so did Johnston’s attempts to have the property rezoned so he could carry out business. Eventually, the Park Service had the property condemned—with Johnston’s agreement—and it acquired the land through eminent domain. Johnston offered some bluster in the newspaper, claiming he would fight the move “to the highest court in the land,” but informal accounts actually suggest it was a friendly transaction, carried out in the manner it was through mutual consent of both parties because it would be most advantageous to Johnston, who pocketed about $202,000. It’s the only time Fredericksburg & Spotsylvania National Military Park has acquired property through condemnation. You can see how disruptive the plant was, even uncompleted. In this shot, you can see the plant on the right (1). The Chancellorsville intersection sits almost at the top of the photo (2), with Fairview across the street (3). Modern Route 3 runs diagonally between them. 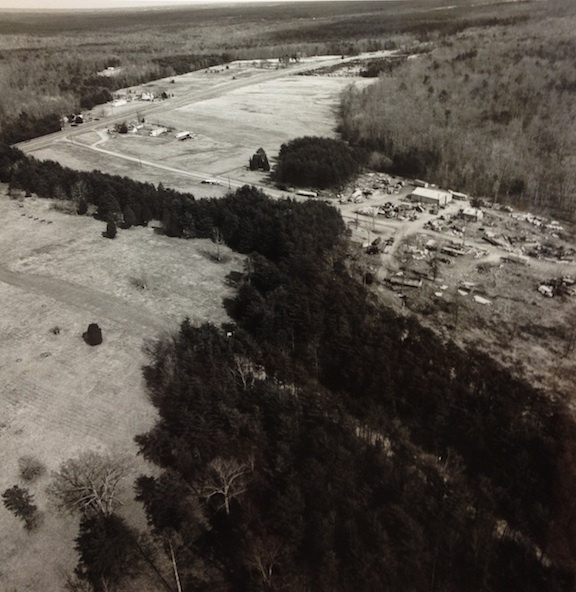 The Chancellor family cemetery is obscured by the stand of trees just to the bottom of the “3.” A line of trees to protect the viewshed rain along the paved road to the cement plant; the remains of that paved road are still there today. Beyond sit a few canon (4), pointed from Fairview toward Hazel Grove. This entry was posted in Battlefields & Historic Places, National Park Service, Photography, Preservation and tagged Battle of Chancellorsville, Chancellorsville. Bookmark the permalink. Interesting story & photos. Glad they were able to get land back from cement business. Thanks. I agree, it was lucky that the NPS was able to finally get the property. The area around Fairview is gorgeous, and definitely worth a walk-around if you ever get there. The cement plant would’ve been disastrous for understanding the ground. It’s a shame that there is actually un-preserved land within the borders of our National Military Parks. And the things put there are usually not historically significant, and actually take away from the scenic beauty and historical accuracy of the location. Thank God this part of the Chancellorsville battlefield is in the hands of the NPS now, and will preserve it for future posterity. The history of land preservation for battlefields has a long and complicated history. I’ll have to write about it sometime. In the meanwhile, Google “NPS Antietam Plan” and see if it turns up anything for you. The idea was to preserve roadways, with the (ultimately mistaken) belief that the surrounding farmland would always be farmland and so would not need to actually be purchased to be preserved. Urban sprawl quickly started filling in the gaps, and the government has been playing catch-up ever since. The problem of battlefield preservation is especially acute in the East. For obvious reasons the Armies of the Potomac and Northern Virginia concentrated in the vicinities around Richmond and Washington, DC. The Greater DC area has seen spectacular growth in the past 25-30 years, especially since the creation of the Metro system. Shiloh is in rural Tennessee and has the benefit of being so remote that it seems secure. Still, some places in the West are experiencing pressure caused by growth. Friends and I traveled to Bentonville, Arkansas to visit Pea Ridge about five years ago. The once empty fields around the national military park are quickly turning into office parks for Wal Mart employees headquartered there. Even further West, the battlefields and sites are losing ground as well. Literally. With cutbacks at the state levels, many Civil War-related sites can no longer be kept either up or open. My personal salary cut wouldn’t seem so hard to take if I could believe the money was going to save a site somewhere.